If you are having difficulty, be sure and check for answers in this section. Otherwise, use the Get Help link. I’m having difficulty viewing the TCPS Orientation Content or taking a Quiz. Review the Technical Requirements to make sure you have all the needed plugins for your browser. Make sure you are allowing Pop-ups. How do I disable Popup Blockers? Review the How to Disable Common Pop-Up Blockers handout. If you have other Pop-Up Blocking software on your computer, refer to the software documentation. I’m having difficulty viewing the TCPS Orientation Content. When I click on an orientation content link, a new grey screen opens, but no content is displayed. You need to make sure that you have the most recent version of FLASH. Download the latest version of Flash based upon your operating system! In the address bar at the top, type chrome://plugins and press Enter. Under “Type: PPAPI,” click Enable. I am trying to login to the TCPS site but my password is not working. Make sure that you are using the CONTENT Password to access the site’s content. This information was provided to you by your instructor or school. Your QUIZ Username/Password will only work when logging into the TCPS Quiz Management System. I need to review orientation content for a new facility that I have been assigned to for a clinical rotation. Use the Access Orientation link under the Student/Faculty Portal to access the Orientation menu. Select Step 2: Facility Orientation to access this content. I cannot open any documents or handouts from the TCPS Orientation site. When I try to open a PDF handout, the file is either all black or white with no content displayed, or has garbled characters. Remember there are specific step by step instructions for creating your Quiz account that is available under Resource Handouts in the Clinical Orientation components of the TCPS OrientPro site. My school is not listed in the Quiz Management System (QMS). Contact your instructor. They will need to request that the school be added. You will not be able to complete orientation until your school is added. I’m confused about the Content Password and the Quiz Username/Password. The TCPS OrientPro Clinical Orientation Program uses 2 sets of access credentials: Content and Quiz. Your faculty or school should have provided you with the CONTENT Password. The Content Password is generic and all students and faculty use the same password to access the content component of Clinical Orientation. By using the generic Content Password, your school does not have to pre-load your name and other information into the TCPS system before you can access the information. This saves everyone time on the front end and you do not have to wait until the information is uploaded to begin your orientation process. The Quiz Username and Password is specific to YOU. You may NOT use the Content Username/Password as your Quiz Username/Password! You will create your Quiz Username/Password the first time you go to the Quiz Management System. You should use your student ID number as your Username (the number that you use on scantrons or other school related practices where you need an ID that is unique to you). If you do not have a school ID, use your initials and last five (5) digits of your Social Security Number as your Username. Create a password that you can easily remember. You will use this same Quiz Username/Password throughout the academic year, so be sure and write it down in a safe place. The TCPS OrientPro Clinical Orientation Map handout is a great place to record this information. Just file it in a safe place where you can retrieve it any time you need to take another quiz – such as next academic term when you receive a new clinical assignment to a different facility, or need to reprint your completion certificates. There are handouts available to you that will walk you through the process of setting up your Quiz Username & Password found in the Resource Handouts link in the orientation content. Be sure and reference these if you need assistance. Learning to manage your digital credentials is a component of professional practice. You will need to manage many of these credentials in your clinical practice. Failure to do so correctly can impact patient safety and your success as a healthcare professional. Be sure to write down your usernames/passwords for this system since you will use it again this academic year! I’ve forgotten my QUIZ username and/or password. If you are trying to remember your username and password from the 2016-2017 academic year, create a NEW account. All users from AY2016-2017 were purged from the system in a clean up process in July 2017. If you have already set up an account for this academic year (since August 1), DO NOT set up a NEW account in the system. Schools are only allotted a set number of user accounts based upon student headcounts. Please use the Get Help link to request assistance. Click on the Forgot You Password? link on the login screen of the TCPS OrientPro Quiz Management System (QMS). You should immediately receive two emails with a system-generated password to the email address that you entered in the QMS when you set up your account – most likely your school email address if you have one. The subject line will be GeoLearning Password Reset and it will be from Learning Systems Administrator. The first email will confirm that a password has been reset for your username and will follow in a second email. The second email will contain your new password. Be sure and look in your JUNK or SPAM folder if this email is not found in your Inbox. If you did not receive this email, it is most likely blocked by your firewall due to the word “password”. Use the Contact Us link instead. You will be prompted to change this password when you next log in. Use the password that was emailed to you as the OLD password and then change your password to something you can remember. Ideally, you should write this down with your username for future reference. Note: The system-generated password is only good for 7 days. If you fail to login and change the password in this time frame, you will be locked out of your account. Please use the Get Help link to request a manual password reset. I’m locked out of my Quiz Account. There are a couple of reasons for a user to be locked out of their account. If you have repeatedly attempted to login using a wrong username or password, the system will lock you out for security reasons. Close your browser and go back to the LMS again. If you still get the error message, try restarting your computer and return to the Quiz LMS again. If you still get this message, please use the Get Help link for further assistance. If you requested your password to be reset using the Forgot Password link on the login window and have not attempted to re-enter the account for 7 days, your account will be locked. Please use the Get Help link to request a manual password reset. I requested a new password and have not received it. There are two ways you can request a new password. 1. If you used the “Forgot Password” link on the login screen, you should have immediately received two emails. These are system-generated and will sometimes go directly to your SPAM or JUNK mail depending upon your firewall and security settings. Check these mail folders for your new password. The mail will be from Learning System Administrator at SumTotalSystems.com. Note: The system-generated password is only good for 7 days. If you fail to login and change the password in this time frame, you will be locked out of your account. 2. If you used the Get Help link to request a new password, then you should have received this information within 24 hours or sooner. This type of request is a manual reset. Your new password will come via email to the email address that you entered on the request form. Sometimes this email will go directly to your SPAM or JUNK mail depending upon your firewall and security settings. Check these mail folders for your new password. If you did not provide a valid email address, you may need to re-request the password using the Get Help Link again. The TCPS OrientPro Clinical Orientation Program uses 2 sets of access credentials: Content and Quiz. Your faculty, school, or facility should have provided you with the CONTENT Password. The Content Password is generic and all students and faculty use the same username/password to access the content component of Clinical Orientation. By using the generic Content Password, your school does not have to pre-load your name and other information into the TCPS system before you can access the information. This saves everyone time on the front end and you do not have to wait until the information is uploaded to begin your orientation process. The Quiz Username and Password is specific to YOU. You may NOT use the Content Password as your Quiz Username! 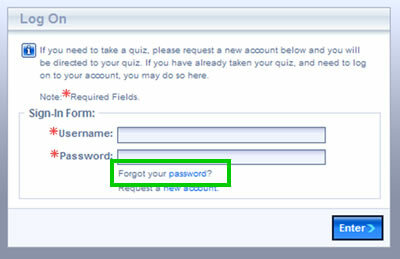 Students & Faculty: You will create your Quiz Username/Password the first time you go to the Quiz Management System. Create a username and password that you can easily remember. You will use this same Quiz Username/Password throughout the academic year, so be sure and write it down in a safe place. Just file it in a safe place where you can retrieve it any time you need to take another quiz – such as next academic term when you receive a new clinical assignment to a different facility, or need to reprint your completion certificates. There are handouts available to you that will walk you through the process of setting up your Quiz Username & Password. Be sure and reference these using the Resources Handouts link from the Orientation screens if you need assistance. How do I find the quiz I need to take? There are Resource Handouts from the General Orientation content page as well as each facility specific orientation that requires a quiz. The TCPS OrientPro Quiz Catalog in the Quiz Management System holds all quizzes that are available. Once you have logged into the Quiz System, click on the Quiz Catalog link to view the various quizzes. The required FERPA Release and General Orientation Quizzes will be listed first and then all facility specific quizzes will follow in alphabetical order. My computer freezes or nothing happens when I launch the quiz. Make sure that your computer does not have pop ups blocked. Try minimizing the initial white screen that states the quiz will open in a new window – some browser settings will cause the screen to be behind the initial white screen! It is Friday evening and I cannot log into the TCPS Quiz Management System – or the system does not let me print a certificate. The system has a scheduled downtime each Friday evening and may be unavailable for several hours. Try again later. The system will display a warning banner each Friday to alert users of the downtime. I retook my quiz to improve my original passing score but the TCPS OrientPro Quiz Management System still shows the lower passing score. The Quiz Management System will only record the first passing score. Depending upon the number of questions in a given quiz, passing scores will range from 90 – 92. Subsequent attempts to improve your score will not be recorded in the system. I need a replacement completion certificate for either General Orientation or a specific facility for this academic year. Log in to the Quiz LMS as a returning user! You will need your specific Quiz username and password that you created when you first took the quiz. If you have forgotten your username and/or password, see the content under Troubleshooting Quiz Accounts entitled I’ve forgotten my username and/or password. Click on the Quiz Certificates icon on the QMS Learner Home page. The screen will display all quizzes that you have taken. Select the Quiz Name of the certificate you need to reprint. Click o n PRINT CERTIFICATE icon to retrieve your certificate. Adobe PDF Reader is required to view and print the certificate. You will have the option of opening the file or saving it to your computer. To print the certificate, you will need to OPEN the certificate and have print capabilities with your computer. I need a replacement certificate from last academic year (for students who completed orientation in January through July of the previous academic year). Use the Get Help link to request a replacement certificate. Facility specific orientation is often updated each term, so you may need to repeat this orientation each academic term. Check with you instructor for direction. Note: Your General Orientation Certificate is only good for 12 months. You must repeat this content each academic year. I need a copy of the Clinical Passport Document to complete and turn in to my instructor. Use the Student/Faculty Portal link to access Orientation. On the right of the screen use the Step 3: Clinical Passport link to access this document. My Quiz certificate has wrong information or is blank! My quiz certificate has the wrong school listed. My name has changed and I need to update my user account name. Use the Get Help link to request that your school/name be updated. My Quiz Certificate does not show my name, school, etc. unless I click on the field. I am using a MAC computer. This is a known issue for MAC users that use the built in PREVIEW program instead of Adobe Acrobat Reader to save/print their certificate. Often this program is set up as the default for PDF files, so PREVIEW is automatically used. The result is a corrupt file that prevents form content from being displayed in Adobe Acrobat Reader. The easiest fix is go back and pull a copy of your certificate from the Quiz Management System and SAVE your certificate to your computer. Then open Adobe Reader and have it open the file for printing or sending to your instructor. Click on Forms > Add or Edit Fields. Click on Edit > Select All. Right click on one of the form fields and click on Properties. Click on the Appearances tab. Click on Close Form Editing. Print the file as needed. Your form data should now be visible.